The Castles of Burgundy is a dice rolling and tile placement/set collection board game from Stefan Feld originally released in 2011. It plays two to four (fine at all player counts, but great with two) and lasts somewhere between one and two hours. I’d put off reviewing any more Feld games as I’ve done a few recently, but I couldn’t resist because: 1. this is one of my favourite games; and 2. it’s currently available for less than £20 (April 2015) from various sources (including Board Game Guru) – a proper bargain. In the box you’ll find 250 small cardboard tiles, a game board and player boards and some dice. Alea tend to make perfectly serviceable yet unremarkable components and this is more of the same: no complaints, and while there’s nothing to write home about I do really like the incidental artwork on the tiles. While Castles of Burgundy is as fiddly as you’d expect from a game with this many cardboard chits, it’s not actually a complicated game to play – or hard/long to set up and play once you get used to it. There are five rounds, each split into five pairs of turns for each player (so everyone will take 50 actions in a game), with scoring done both during and at the end of the game. The main thrust is ‘buying’ tiles from a central board then matching them in sets on your own board to score points. Each colour of tile has its own special action, seeing clever play lead to strong combinations that can turn the tide of a game – and opening up a number of different strategies. But as only a small number of tiles are available each turn, and these randomly drawn, there is also a large amount of tactical nous required too. In terms of mechanism, Castles of Burgundy is a relatively simple game – as borne out by the 12-page rulebook which is really more like four pages of rules and six pages of tile explanations – a bare minimum of which you’ll need to reference after a play or so. In each round players roll their two dice and use them to either take tiles from the main board to their depot; send them from their depot to their player board; export goods for points, or take tokens that can be used to manipulate the numbers on the dice rolled. If a placed tile has a special effect, you do that too. Simple. These tend to be standard gaming ideas: manipulating turn order, giving free actions, multiplying points etc. I think anyone with a few gateway games under their belt will be at home with Castles of Burgundy, but that’s not to say there isn’t something here for more seasoned gamers. As is so often the case with Feld’s games, the simple mechanisms hide a lot of small yet tricky decisions – in most turns you’ll want to do a lot more things than you have actions, so its all about prioritising. You’re taking tiles from a shared stock, remember, so anything you leave after your turn may not be there by the time it is your turn again. So while the game does not have direct interaction, it is alive with the indirect kind. The writer: Castles of Burgundy is currently my favourite Stefan Feld design, partly because of its broad appeal – it hasn’t made it into the Board Game Geek Top 10 (or my own) by accident. The theme is innocuous but the game looks good on the table; it fits well with both experienced and gateway gamers, and plays in that sweet ‘one-to-two hours’ slot. And while yes it has dice, meaning there will be luck involved, it does feel like good play wins you the game. The thinker: I do tend to enjoy Stefan Feld’s heavier games, and would usually take the likes of Trajan or AquaSphere over this, but I certainly won’t turn down a game. Despite the randomness the game still packs some heft and much of the random can be mitigated by a canny player.The fact it comes with different player boards adds to the strategic choices too, allowing more advanced players to try different ideas from one game to the next. A solid mid-weight game. The trasher: We’re not really in my territory here, but this is definitely a more palatable Feld game. Once you get past the boring theme/box/components there is some rich tactical play – but only with two. Especially in the timing of getting ahead in turn order and taking the right tiles, you have to watch your opponent like a hawk. And I have to admit I’m a sucker for a game that gradually pushes everyone up to scores around 200 but its still often really close, nip and tuck, all the way. 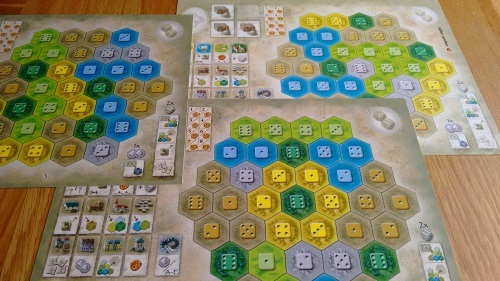 The dabbler: There’s a lot to like about Castles of Burgundy. It has dice! But its not blind luck and while they can kick you when you;re down, you never think they were to blame if you don’t win. It has cute animals! The farming tiles are gorgeous and a bit like Carcassonne, the board looks lovely at the end of the game. While it feels competitive, it never feels nasty – the perfect combo for me. And while people can be wary of it as it looks complex, its bark is much worse than its bite. It’s fiddly. From setup to scoring (which can be easy to forget) to re-setup after every five rounds, this is very much a game of moving little bits of cardboard around. If this is truly off-putting to you, I’d suggest trying it online first: it is available to play at both Yucata and Boite a Jeux. I expect many will find the game play trumps the fiddliness. Each extra player removes some strategy (as it takes longer to take your next tile, reducing planning potential), while adding downtime and game length – and very little on the positive side, if anything. This is definitely a better two player game and can feel slow with four, especially as interaction is limited to blocking tiles. There’s also little here for the theme fan and again, interaction is at a minimum – although I’d argue that a two-player game can feel very tactical (hence my ‘thrasher’ above enjoying their plays). If you really don’t like Feld games, this will not convert you – I suggest you run for the hills. When I read the low score reviews for Feld games, it is always the same people moaning – why on earth do they play them? I think claims the game has no focus or that the best player doesn’t win are groundless. I simply think these players haven’t given the game a chance, or paid enough attention, or played anyone any good – their prerogative, but I feel its in poor form to criticise the game on this point, as they’re in less than 1% minority of players. Ignore them. While I’m not sure I’d celebrate Castles of Burgundy as Stefan Feld’s best design, I think it’s his best two-player game and one of my favourite two player games by anyone. Turns are short and snappy, there are interesting/agonising decisions to be made on almost all of your goes, and while the game has some tactical and strategic depth it is accessible to both gateway and experienced gamers alike. If you’re a couple that is starting to explore games, and have enjoyed the likes of Ticket to Ride and Carcassonne, I’d certainly suggest this as a step up the ladder. But if you prefer the interaction of Catan, or the combat of Small Worlds, you may want to look elsewhere. This entry was posted in Board games, Games and tagged board game, Board game review, board games, boardgame review, euro game, Stefan Feld, The Castles of Burgundy, The Castles of Burgundy review by Chris Marling. Bookmark the permalink.